The Easter Season continues. Although this week is the third Sunday of Easter, our Gospel reading still continues the story of that day! This week we see two un-named disciples leaving Jerusalem on the evening of Easter Sunday. I had to laugh at the picture above as the disciples fail to recognise Jesus! (Clue: Jesus is the one in the middle dressed in the white!) In the real biblical account things were not so obvious! Jesus walks with them, yet they fail to recognise him until he reveals himself to them at the breaking of bread. Are we the same? Do we often fail to recognise Jesus? He is often not so obvious as in the picture above! Find out more this week. Our bible readings for the Third Sunday of Easter are Acts 2:14a, 36-41,1 Peter 1:17-23, and Luke 24:13-35, and we will be singing the hymns Alleluia Alleluia Give Thanks, Jesus Christ is Risen Today, One Bread One Body, and Christ is made the Sure Foundation. The readings can be found via this link! Our next Theology on Tap group will be this Friday, 28th April, and will again be at the UN Irish Pub. We will begin at 7 p.m. and our topic will be The Death and Resurrection of Jesus: What does it mean and did Jesus have to die? Everyone is welcome to join! This week we will be using a new version of the Gloria, Sanctus, and Kyrie – the parts of our worship beginning Glory to God, Holy, Holy, Holy, and Lamb of God… You can listen to them by clicking on the name and you can view the music score here. Last week we had two very moving services on Maundy Thursday and Good Friday. Pictures can be seen on the All Saints Facebook page, and video of the Good Friday service is on the Audio-Visual page of our website. 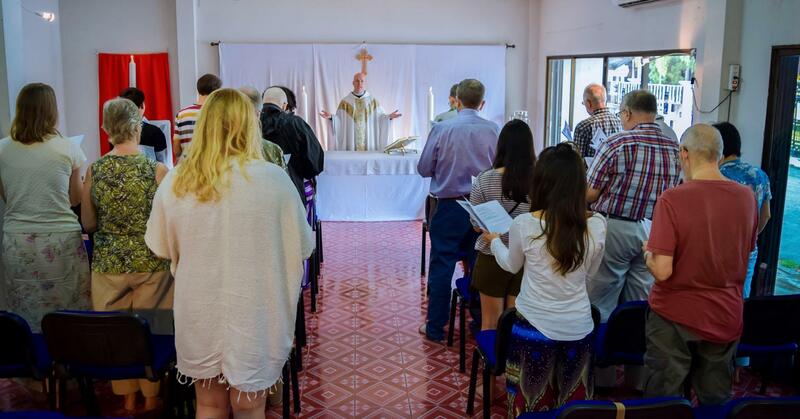 Then on Easter Sunday we gathered together to celebrate the resurrection! A joyous and uplifting sung Eucharist was followed by a warm and inviting potluck lunch and enthusiastic Easter Egg hunt! You can again see pictures on the All Saints Facebook page, and video of the Easter Sunday service on the Audio-Visual page of our website. For the next seven Sundays until Pentecost, we will celebrate the resurrection as we live the Easter Season of the Church. For those who were travelling and missed our Easter Sunday service, this coming Sunday will give a second opportunity to celebrate Easter. We will again sing many of the Easter hymns and we will be reminded of the risen Jesus as he appears to the disciples in the upper room. Our bible readings for the Second Sunday of Easter are Acts 2:22–32, 1 Peter 1:3-9, and John 20:19-31, and we will be singing the hymns Alleluia Sing to Jesus, The Day of Resurrection, Christ is Alive, and Thine Be the Glory! The readings can be found via this link! Our next Theology on Tap group will be on Friday 28th April, and will again be at the UN Irish Pub. We will begin at 7 p.m. and our topic will be The Death and Resurrection of Jesus: What does it mean and did Jesus have to die? Everyone is welcome to join! Please join us at All Saints as we observe Holy Week and Easter. Our services begin tonight at 7 p.m. with our Maundy Thursday service. 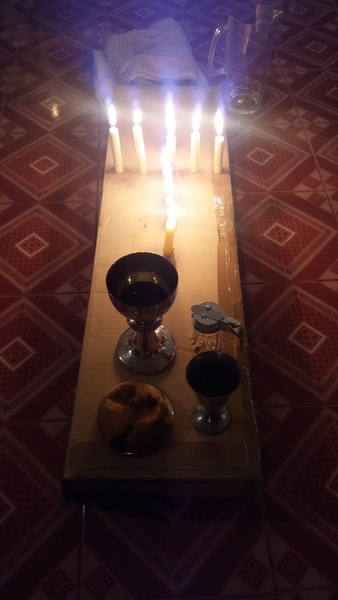 This will be a quiet meditative service with Taizé music, washing of one another’s feet, an informal Eucharist, and anointing with water from the Holy Land. Our observances continue on Friday morning at 11 a.m. 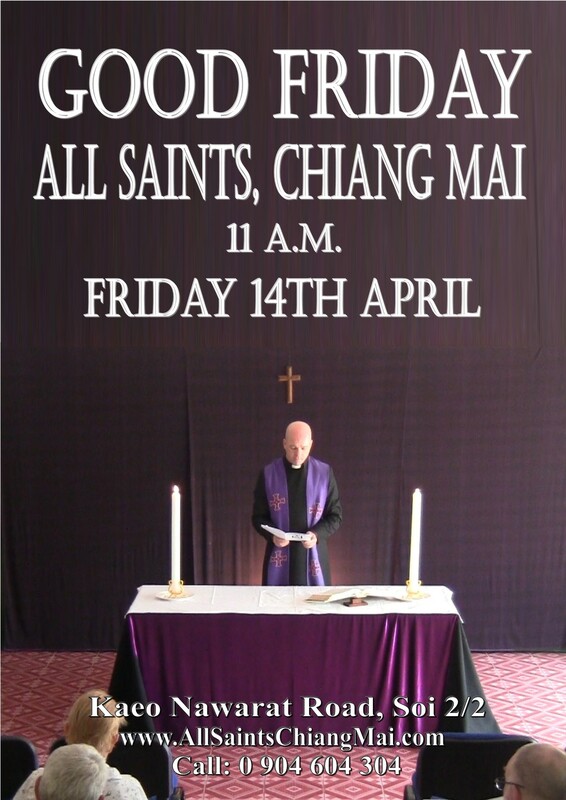 This will be a solemn Tenebrae Service with traditional Good Friday hymns. 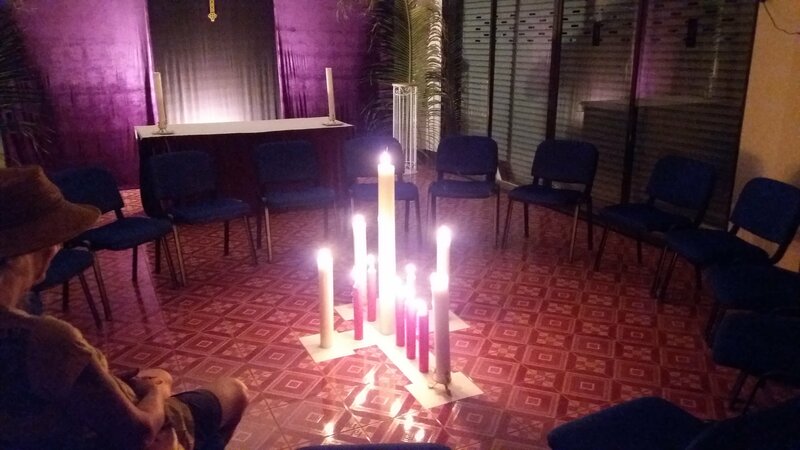 As we read the story of the Passion, candles will be extinguished, and we will leave the darkened church in silence, as we remember that Christ died for us. Our celebratory Easter Eucharist will begin at 11 a.m.
We will give thanks together as we rejoice in the resurrection of the Lord! While many people will be away over the Easter Season, it was great to again see nearly thirty people at All Saints last Sunday! 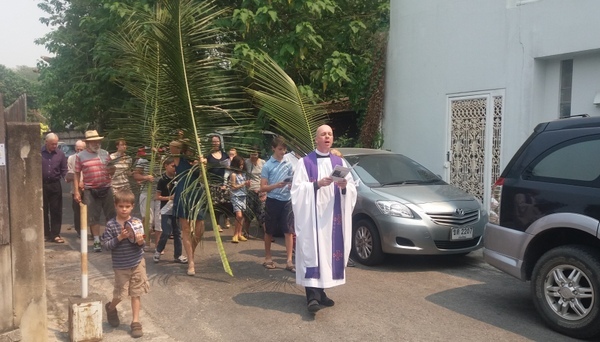 This Sunday is Palm Sunday, and we will begin our worship with the Parading of the Palms. Our service will also be followed by a pot-luck lunch! As we enter the Easter Season we focus on the central aspect of our faith – God’s unlimited love for us and all the world. Let us be people of joy, ready to give thanks for all that God in Christ has done! We also need to give thanks for the coming ordinations of Gene Bourquin as Deacon on 13th May, and Connie Mudore as Priest on 5th June. 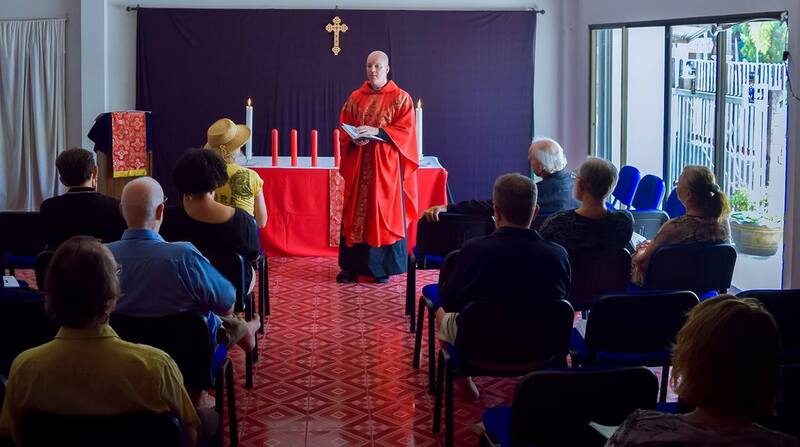 Gene will be ordained in New York and will be joining us to minister at All Saints in August. Connie will be ordained in London and will return later in June. 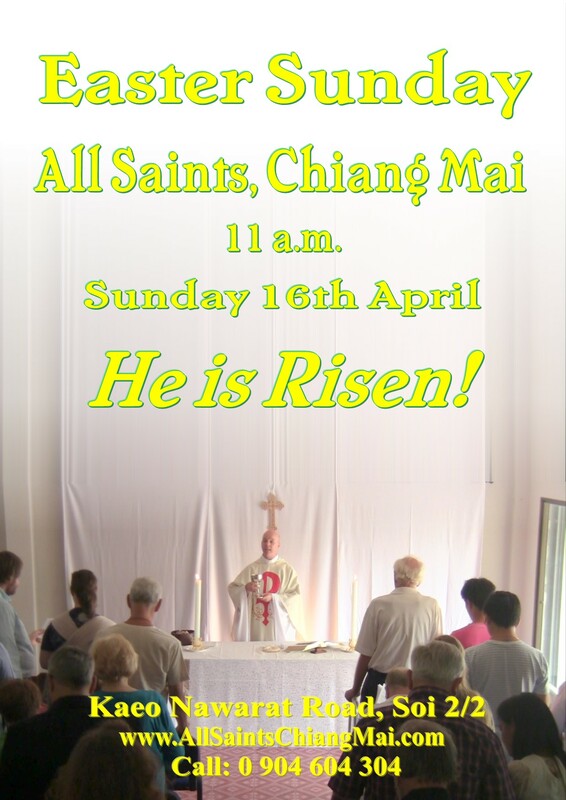 Connie will be developing a chaplaincy ministry in Chiang Mai and will also be based here at All Saints. Gene has also been working on the All Saints Facebook page. You can visit and like the page and add your own pictures or comments. Our bible readings for Palm Sunday are Matthew 21:1-11, Philippians 2:5-11, and Matthew 27:11-54, and we will be singing the hymns Hosanna in the Highest, All Glory Laud and Honour, Hosanna Loud Hosanna, You are the King of Glory, and Ride on Ride on in Majesty! The readings can be found via this link!